Searching for a clean, contemporary look for your outdoor space? Look no further than the versatile Westcott Table with Six Sling Spring Chairs. This set is sturdy and durable, as all the pieces have rust-resistant aluminum frames that are highly suitable for outdoor use. The table features a drop-in tile top that brings a fresh, modern look to your outdoor dining space. Enjoy the comfort of the Dolby sling outdoor fabric that covers all the sling spring chairs. Redefine outdoor summer meals with this sensible weather-resistant set that the whole entire family will cherish gathering around for the long haul. Searching for a clean, contemporary look for your outdoor space? Look no further than the versatile Westcott Table with Six Sling Spring Chairs. 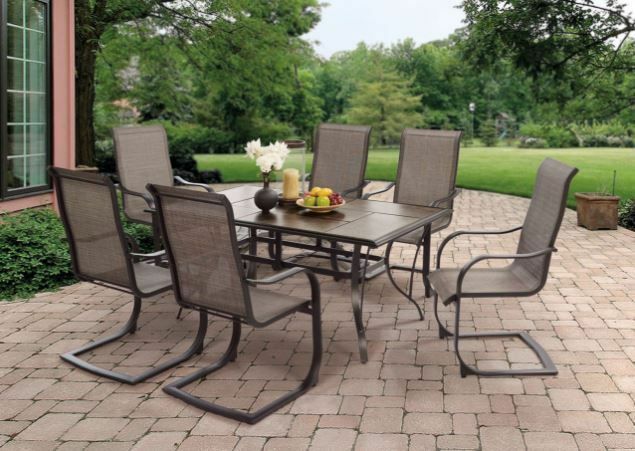 This set is sturdy and durable, as all the pieces have rust-resistant aluminum frames that are highly suitable for outdoor use. Powder coated aluminum frames, table has drop in tile top.